Financial infidelity is a real thing. It can ruin relationships and financially devastate families. You've probably heard stories of people hiding accounts, buying big ticket items without their partner's knowledge, or cleaning out a joint bank account. Infidelity ruins trust and robs the relationship of financial stability and security. But what happens if you're the one who's been unfaithful? How do you correct the issue and change course? And most importantly, how do you win back your partner's trust and repair the damage? Before you drop the bombshell on your partner, it's a good idea to take a moment and understand why you did it in the first place. You really have to become introspective and do a bit of soul searching to understand your motives. Your reasons could be deep-seated issues that stem from your childhood. Or, they could be a simple momentary lapse in judgment and self-discipline. You could be driven by fear, lack of trust, or maybe you've just been given bad advice. It's important to unearth your fears, hidden control issues, or whatever is driving you to exhibit this behavior. When you do reveal what you've done, be upfront and open. It's important that you don't try to downplay or sugarcoat your actions. And don't blame your partner for driving you to do what you've done. Your partner's actions may have contributed to your decision to be dishonest, but the onus is on you. It's also important that your confession is accompanied by a sincere and heartfelt apology. Most people need to see or feel remorse in order to begin the process of forgiveness. Showing remorse places you in a posture of humility and displays that you understand — to some degree — the depth of your actions. Give your spouse space to be angry and don't allow their anger to make you angry. Of course, the more egregious the infraction, the more you may need to apologize. Spending the grocery money on shoes can be wiped away with a simple sincere apology. However, stealing your partner's identity to finance a motorcycle you've kept hidden in a storage shed across town requires more than a shoulder shrug and flippant "Sorry." After you have confessed your financial infidelity and apologized to your spouse, you need to add some sort of reassurance that this won't happen again. At the very least, assure them that you are working to correct the issue. And that requires more than just a verbal statement. Communicating difficult things to someone you love is not only gut-wrenching, but it can also be tricky. Especially if it's something that will hurt them. Writing your spouse a letter explaining yourself is a great way to get things out in the open and start the conversation. This is especially true if verbal communication is difficult for you or if your partner is explosive or talks over you. It allows you to process your thoughts and explain exactly what you've done and how you feel in a clear and concise way. Keep in mind, it shouldn't take the place of a face-to-face conversation — it's merely a way for you to analyze, process, and explain things in a controlled environment before sitting down to talk further. When penning your letter, make sure you follow the steps previously outlined. First, ensure you understand why you committed the infraction. Then, explain exactly what you've done in detail. Take full responsibility for your actions and explain your reasons for making the choices you've made. Make sure that you express remorse and sincerely apologize for your actions. From there, you want to propose a plan of action that allows you to be more accountable to your partner and ensure that this type of thing doesn't happen again. 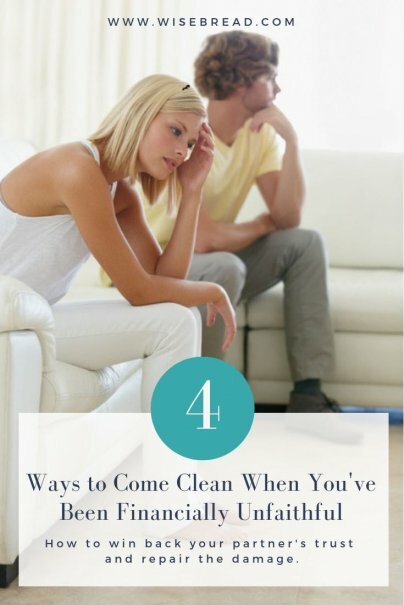 You also want to give your spouse room and permission to feel hurt, betrayed, and angry.